The nose does not get enough credit for being the incredible sense that it is. Your sense of smell is very keen, to say the least. Your eyes can’t see in the dark but your nose can sniff things out no matter whether it is day or night. That is one of the reasons man has been trying to mask over foul odors since pretty much the dawn of times. One of the worst places to have a bad smell is the confined space in your car. That is why people are always shopping for the best car air freshener that they can find. Perfect for : Small spaces such as cars, closets, bathrooms, pet areas and laundry rooms. Contains : True scent of fresh new leather. Provide : Protection against bacteria and viruses. This is another great all-natural type air freshener on our list. All you have to do is remove the plastic on this air freshener and put it in place to get it working. Once you do that your car will smell incredibly good. It is effective because it uses activated charcoal which has long been used to treat both air and water to help remove contaminants. It will also keep working for a very long time before needing to be replaced. 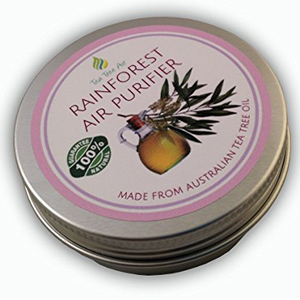 It’s no secret we are big fans of natural air fresheners and this is a good one. It uses activated charcoal to not only mask over foul odors but it helps permanently eliminate them too. This product is really easy to install and get working too. Some might not like the fact you have to find a convenient place to put this bag type air freshener without it falling on the floor all the time. It also is not easy to circulate the air in your car through this bag to make it as effective as possible. This is a nice combination kit from the reputable car product people ‘Chemical Guys. They have made a spray on car air freshener that lasts a long time and does not have fragrances that are overbearing to your sense of smell. The package contains the fragrances new car smell and leather smell. These both come in a concentrated for so they will last you a very long time once mixed and applied. These air freshening products are known to last up to 5 times longer than a hand in your car air fresheners. We really liked the fact that these air freshening products had a scent that is very subtle; too many in-car fresheners are overpowering when you first install them in your vehicle. This is also a nice combination package that is sold at a very affordable price. For us, it seemed like there was a little too much involved with using this air freshener. It’s very concentrated so you had to mix it before you can spray it on. Not only that but you had to let it dry for a few hours before you could get in your car and drive. If you are looking for a really long-lasting and reliable car air freshener, then PURGGO’s product would be your best deal. Due to its natural ingredients, you will not waste your money on refilling. Moreover, this product will keep the unwanted stench away from your car for more than a year. The chemical-free process of eliminating odors is among the benefits we saw in this product. This cushion-like car air-freshener does not mask the smell. Instead, all odors pass through the unit and are kept inside. 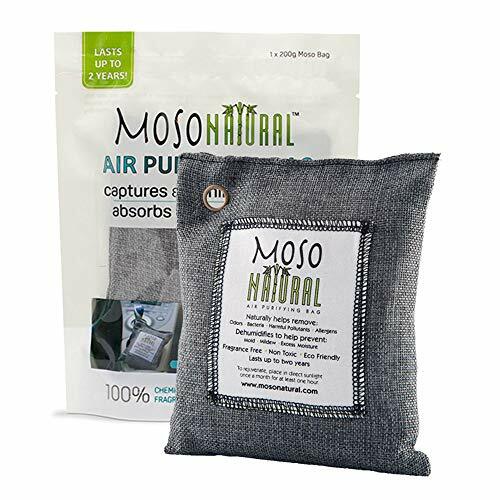 Another thing we really liked is the natural ingredients and therefore this air freshener is perfectly safe for children, pets and people with inhaled allergies. And if this is not enough, the upkeep is really simple-just let the product stay in direct sunlight for a couple of hours and then it will be fresh and clean. Bamboo and hemp are the sole elements of this car air freshener, but natural resources have some drawbacks in terms of time. You may have to wait a bit until the product starts working. In addition, the unit has no smell and there is a chance of not feeling the difference, even after a few days. 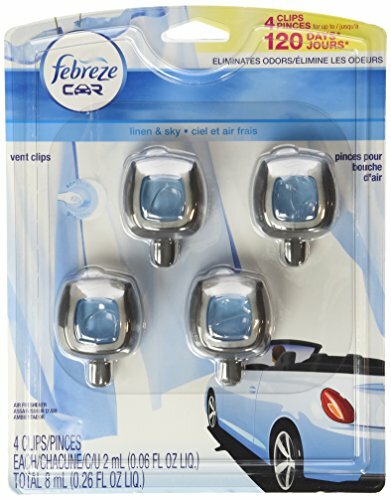 There is no easier way to eliminate foul smells coming from your vehicle than to use these air fresheners from Febreze. 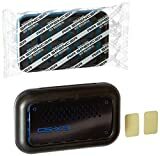 It is a company that is known for the effective odor masking products that it sells These are super easy to install and works great once in place. There are 4 air fresheners in all that come in this package. That means you will have a lot of coverage in your car when it comes to eliminating bad odors. You will really notice how nice these smell when you first get in your car. The installation of these air fresheners is so easy. All you have to do is clip them onto the vents in your car. In just a matter of a few minutes, you will be smelling sweet linen and flowers instead of the bad odors you were experiencing before. We told you that these clip to the air vents in your vehicle. The problem is they will only work well when there is air coming out of your vents. That means unless you are running the heater, fan or a/c this product will not be nearly as effective. If you are into modern and natural ways to do things, then this is just the right air freshener for you. It is a unique concept in air freshening, to say the least. It uses actual squash in a dried form to make it work and it is surprisingly very effective. This product comes in a vented cassette type package to make it work. It is also a refillable product which will help cut down on the expense when replacing the air freshener packages in the future. 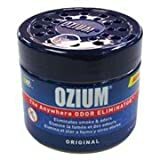 Here is yet another all natural odor eliminator for your car that has no side effects or harsh chemicals that are associated with it. It is a very effective and green way of tackling those sometimes tough to eliminate odors that are present in your vehicle. This product works well but we are not sold on the fragrance of this product. Some people might not like the squishy type of smell that it produces for sure. These also will most likely not last over 2 weeks before they need to be replaced. Tea has long been used to both drink for medicinal purposes and to do other things such as absorb and mask odors. That is the very principle that this nice air freshener uses. It will not only mask over any foul smells in your car but it has been proven to even to help prevent mildew build up and inhibit bacteria growth. This is fair is made using an all-natural evaporative cream. Although it costs more than other types of in-car air fresheners it will last you a very long time once it is working in your car. The best thing about this air freshener is that it is 100% natural. That means that it will not only leave your car smelling good but there are no other possible harmful side effects that come with breathing the air that is treated with it. A few of you who are reading this article would most likely never think about paying this type of prices for an in car air freshener no matter how well it works; it is definitely more than a little towards the pricey side. 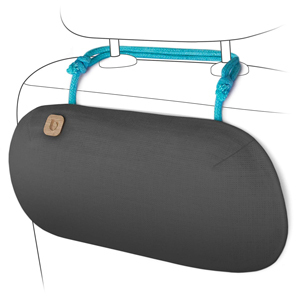 Perfect for : Vehicle, home, garage, office, boat, and locker. 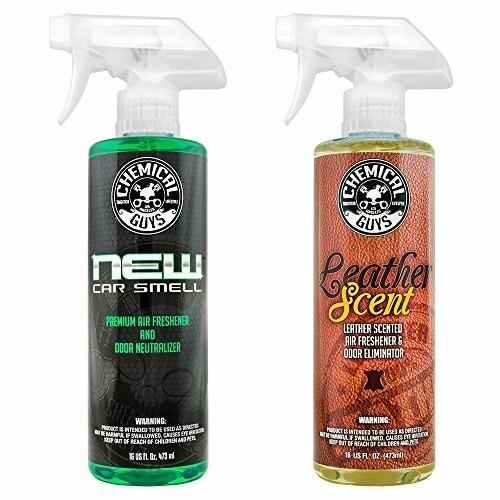 Here is yet another great air freshener from Chemical Guys. They seem to have the magic touch when it comes to making air freshener products that are easy to apply and last a very long time. This spray on ‘new car smell’ product really will make any vehicle smell great. It not only helps eliminate odors but it also uses natural enzymes that will actually eliminate odors at their source. This is a very concentrated formula so it needs to be diluted in a spray bottle; that means just a little bit of product will go a long way before you need to buy more of it. This bottle will last most people a year or more before you will need another. We talked a little bit about Chemical Guys products not being the simplest and most convenient to apply and this one is exactly that way too. It needs to first be diluted and mixed before it can be applied. Once applied it needs time to dry too. Want your vehicle to smell like it was cleaned by a professional? Then try this great air freshening product that is used by many professional car detailers to make it smell good for a long time. 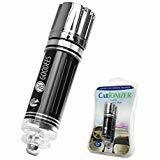 Auto Expressions has designed a convenient and easy to use spray here. This is an ozone-based product. Yes, that is the same ingredient that is used to sanitize and purify all different kind of things. It even has a hint of glycol in it too which is also a very effective sanitizer in itself. We are big fans of using ozone as a sanitizer and air freshener. It has been proven effective for not only eliminating odors by attacking them at the source to eliminate the problem too. There are some concerns we had with this product. For one, despite the fact that it’s inexpensive you only get a very small amount of the product. On some types of smells, the odor does not go away instantly either. Here is the gel brand of the same type of air freshener that we just took a look at above. The gel form is a much more versatile odor eliminator than Auto Expressions spray version of this product. This one even does a great job of eliminating smoke smells. It is another product that many professional auto detailers like to use. If you want your car to smell like it was cleaned by a professional, then this is a must product to have. It’s no secret that some people like to smoke things other than cigarettes in their vehicles. This odor eating gel will get rid of any type of smoke smell very nice if it’s allowed to work overnight. It is compact enough to store easily under the seat or in a glove compartment too. We are always a little concerned when applying gel-like products to upholstery and carpets. It can be messy and hard to apply, to say the least. It also takes a while for it to work (usually overnight) and the product also tends to get used up very quickly. The innovative and somewhat crazy techs at Chemical guys are at it again. We are not sure what their motivation was to create this air freshener smell but it is very creative, to say the least. As with most of their products this one needs to be mixed, sprayed on your car’s upholstery and then let dry. It is a very effective and long-lasting product. A small amount will also go a long way. We like the fact this product uses natural enzymes to help make it effective. It is always best to attack and eliminate odors in your car as opposed to just masking them over. Kudos to Chemical Guys for producing a scent that is different and daring, even though not all of us liked it. This scent is not going to be to everyone’s liking for sure. For one it is a very different type of smell that can be a bit overpowering at times too. Just the very concept of the ‘stripper scent’ will be unappealing to many people too. Also, it takes a little bit of work to apply this. No review list for air fresheners would be complete without an Airwick product; they have long been innovators when it comes to eliminating odors in your home or workplace. This is a great little low-cost product from them. It is convenient that this is a product that can be sprayed automatically or manually. This air freshener can be refilled also. It has a very nice fresh linen scent to it also. There are two things that really stand out about this product. One is how well it works considering its very budget friendly cost. The other is that it is so easy to apply because it’s an aerosol; just a few quick sprays and even the foulest smelling of odors disappear almost instantly. This product comes in a pretty small size so it will get used up very quickly. Although it is an air freshener that works fast, it really has no residual effect so you have to constantly respray the product to keep your car smelling good. Citrus has been one of the oldest and most effective household cleaners and deodorizers for many years now. It has been proven effective at eliminating odors at their source naturally. This fine product from citrus magic takes full advantage of those properties to help keep your car smelling great. This size canister will last you approximately 6 weeks. It will harmlessly mask even the foulest odors that somehow end up being produced in your vehicle. This is yet another all natural cleaner that smells great. There is something about the aroma of citrus that appeals to just about anybody. It is also very safe to use if you have children or curious pets. This product comes in a very small size. It is also one that tends to get used up quickly and need to be reapplied on a regular basis. 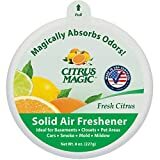 This air freshener smells like it has a little something extra in it besides just citrus which turned us off a little on this product. This is one of a unique air fresheners on our list. 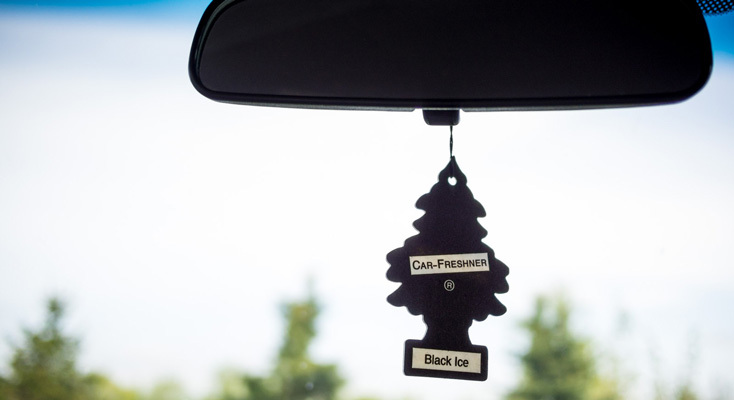 For an inexpensive yet sophisticated air freshener, it really does a nice job of removing unwanted odors from your vehicle. It is easy to install and will keep working in your car for a very long time. It actually works by plugging into your car’s power point. Once that is done it creates an ultraviolet light and ionizer to help control any odors that are present in your car. We really like the type of technology this air freshening device uses and it gets even better with the price point of this product. Some of the purifying concepts it uses are the same as those which help treat heavily polluted water supplies. It is a very effective and natural way to treat odors in your vehicle. We had a few concerns about this product. The first is that there is no way to guarantee the air in your vehicle will pass through the device. The other is that it seems to be a product that is a little bit to the flimsy side in nature. Air fresheners have been around for a very long time. That is easy to agree with because one must assume that bad smells have been around for even longer. The forerunners to modern day air fresheners were things like incense, certain spices, and fruits. 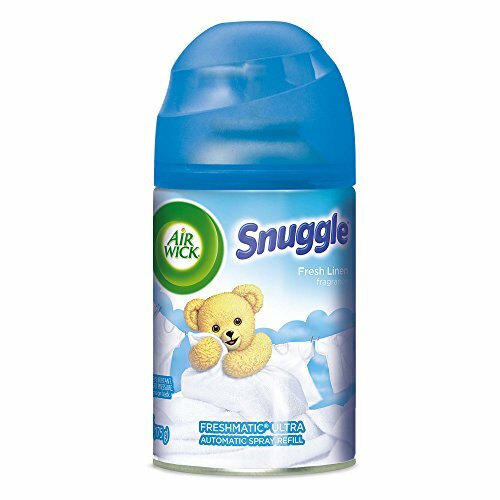 Many of these are even making a comeback today as people seek more traditional and natural ways of making the environment they live in smell better. When were the first modern type air fresheners sold in mass quantities? The first air freshener known to be sold was in 1948. 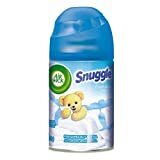 It was an aerosol-based air freshener that was a variation of a device designed by the military to dispense insecticide. These became widely popular but fell out of favor when they were deemed to affect the ozone layer. That was in the 1980s and that was also when the shift towards more natural forms of air fresheners began. It is a trend that is still growing today as companies are still searching for the perfect natural air freshener and unique ways to dispense it. Air fresheners are a great way of making your car smell great. Without a doubt, they are a welcome addition to any vehicle. They alone though are not enough to keep your car interior smelling great all the time. It takes a combination of things in order to be able to do that. So many people wash their cars and then only do a quick vacuum on the interior. In cases like this, it’s no wonder that something you use as often as your car will develop smells from time to time. You have to get to the root of the problem and that means deep cleaning your car carpet and upholstery on a regular basis. A good car carpet and upholstery deep cleaning start first with a good brushing of the fabric itself. This will get deeply embedded dirt to the surface where it can then be vacuumed. 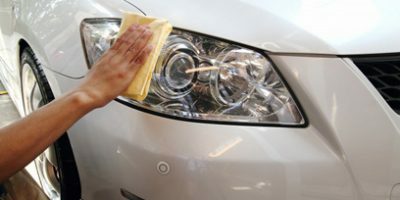 After that, you will again need to shampoo and scrub with a deep cleaning brush and then let your car interior thoroughly dry before you use it again. No car deodorizing process is complete without a final detailing too. Dirt has a tendency to build up around your dashboard, air vents and center console and this residue can sometimes cause odors too. So be sure to clean these areas with a damp cloth, cleaning solution and also have a cotton swab handy to get into small places that need cleaning. $ 4.5 oz. Patented fragrance formula Eliminates odor Vehicle, home, garage, office, boat, and locker. Let’s face it, most people do not even want to get in a car that smells bad let alone drive it for any long amount of time. That is where having the best car air freshener you can buy comes in handy. They can make all the difference between driving with one hand covering your nose or driving around in a pleasant and happy car environment. So don’t take the chance of having a smelly car and always keep a working air freshener inside it. We hope you enjoyed our car air freshener reviews!